Today I finally solved a problem that I have been trying to hunt down for a long time. I haven’t been able to find any good help on this elsewhere, so let me share how I solved it. This is my setup: I have SharePoint Online site, where I open a modal window to load a page from a provider hosted app (Add-In). The app is running in Azure Websites (Web Apps). The page is built with ASP.Net WebForms and displays a simple form that you submit back to the app. 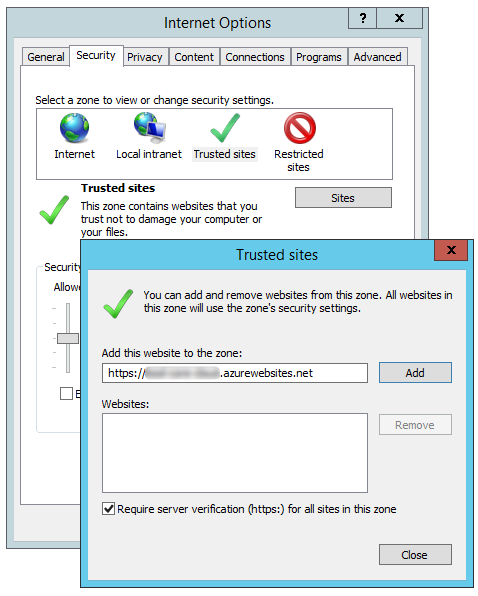 The Azure site need to be added as a trusted site in Internet Explorer! For the curious: The postback never seemed to make it back to the server. Actually it did, but it got stuck in the Page_PreInit() mehod, where SharePointContextProvider.CheckRedirectionStatus() returned a “RedirectionStatus.CanNotRedirect” and the the connection ends. put the below lines of code at page_load event..